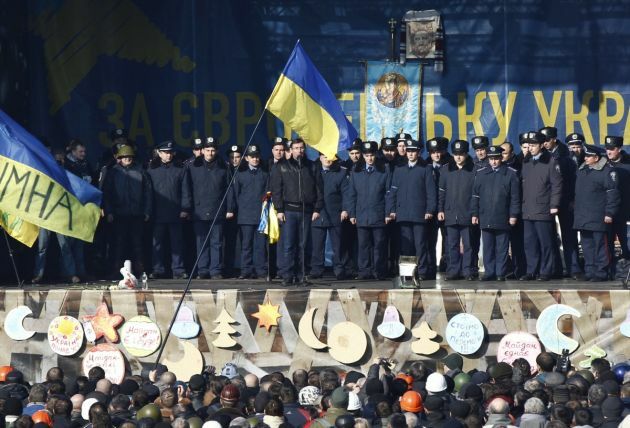 (Photo: REUTERS / David Mdzinarishvili)Police officers from Lviv who have joined anti-government protesters wait during a rally in Independence Square in Kiev February 21, 2014. Ukraine's President Viktor Yanukovich announced concessions to his pro-European opponents on Friday, including a plan to hold early elections. LVIV, Ukraine (Reuters) - The police are conspicuously absent from the cobbled streets of Lviv. They melted away one night this week, when masked rioters ransacked their bases, smashing radio equipment and computers. "It's all destroyed. It's like we're back in 1945, when we worked with notebooks and pencils," said Aleksandar Rudyak, the thick-set police chief for the Lviv region on Ukraine's western border with the European Union. Unlike in the capital Kiev, where police and protesters have traded blows in the worst bloodletting in 22 years of Ukrainian statehood, the forces of law and order in the Lviv region gave up without a fight in the early hours of Wednesday. Some police officers surrendered, hands above their heads. Others were stripped of their armour for television cameras, in what smacked of a coordinated handover of power. Turfed out, dozens of plain-clothed officers instead joined hundreds of citizens on Wednesday night for the first of what authorities are calling 'self-defence' patrols. Rudyak has offered the regional headquarters of the police's feared 'Berkut' anti-riot units as a base for the initiative. The collaboration deepens the sense that this region of 2.5 million, a bastion of Ukrainian nationalism and pro-European sentiment, is slipping from the grasp of the central government and the embattled Russian-speaking president, Viktor Yanukovich. Rudyak knew which way the wind was blowing when he appeared before journalists on Thursday alongside Petr Kolodiy, head of the regional assembly that only a day earlier had declared its autonomy from Kiev, accusing Yanukovich of "waging open warfare against the people". "The parliament takes upon itself all responsibility for the future of the region and its people," the assembly announced. Rudyak said, "I stand with the people of Ukraine." Asked by Reuters if he still took orders from the Interior Ministry in Kiev, the police chief replied opaquely: "I work according to the constitution of Ukraine and the laws of Ukraine. I serve my people with honour." Developments in Lviv, 500 km (300 miles) from the carnage of Kiev's Independence Square, are stirring fears of a country coming apart along an historic cultural and linguistic faultline between east and west. Leaders here vow they will not allow that to happen, but the spiral of violence in the capital is leading Lviv to strike out alone. Events here have been replicated, to a lesser degree, in towns and cities across the west, with varying results. Pulling the other way is the autonomous Crimea region in the south, home to Russia's Black Sea fleet and an ethnic Russian majority. There are threats in Crimea to further cut ties with Kiev if Yanukovich falls and his opponents revive a deal on deeper ties with the EU, which the president spurned in November. Some Russian officials have floated the idea of federalising Ukraine as a solution to its problems, something many Ukrainians suspect is a prelude to breakup. A bastion of Ukrainian nationalism near the Polish border, Lviv is the heart of pro-European Ukraine, standing against those in Yanukovich's power base in the east and south who would have the former Soviet republic turn instead to Moscow for a strategic partner and financial backer. Lviv's baroque and neoclassical architecture recalls its past as a regional capital of the Austrian Habsburg empire. Between the world wars, it was Polish, and Catholicism remains strong. It was once home to Jews and Armenians too. Even before daybreak, the pews of the 400-year-old St. Andrew's Greek Catholic church begin filling up with headscarved women, the building's imposing mix of Renaissance, Mannerist and Baroque styles testimony to the city's turbulent past. The east, by contrast, is blighted by Soviet concrete, home to coal and steel industries and historically ruled by Russian tsars. Many people in the east speak Russian as their first language, and are Orthodox Christians. While residents of Lviv refuse to question Ukraine's borders, some do not hide their contempt for the easterners. "They're different. They're Soviets, factory workers," said one woman who gave her name as Natalia. "Here, even the babushka at the market reads books." Shrines have popped up in the city centre to men of Lviv shot dead on the barricades in Kiev. Many of those on Independence Square have travelled from the west, pawns in an epic struggle between the West and Russia over this sprawling country of 46 million people. Trains from Lviv to Kiev have been disrupted, ostensibly by repair work. But buses packed with volunteers leave nightly, loaded with food, warm clothes, helmets and kneepads. No one stops them. On Friday, around a dozen uniformed Lviv police officers - defectors - were seen marching across Independence Square in Kiev to join the protests. In Lviv, the barricades have largely disappeared since the night of violence, which also saw a police barracks and the 100-year-old public prosecutor's office go up in flames. But the city smells of revolution; men in leather jackets guard the regional state administration, where Yanukovich-appointed governor Oleh Salo worked until he was ousted by his people. Salo was out of town when this reporter visited on Thursday. Power in the region is now vested in Kolodiy, head of the assembly and a member of the opposition 'Svoboda' (Freedom) party, one of three jockeying to replace Yanukovich on the back of the Independence Square violence. Speaking to Reuters, Kolodiy brushed aside concerns in Lviv that Kiev might cut off the cash from the central budget, saying the regional authority had enough to get by. But one security official confided he expected to forgo this month's salary. Food prices were rising, he said, and people had started stocking up. Though this region has a long history of resistance, it remains to be seen how long its improvised 'autonomy' can last. "It will be the economy that decides how long this self-organisation (of Lviv) can last," said Oleksandr Antonyuk, a political analyst in Lviv. "The longer this conflict drags on, the more the talk of federalisation. Where does the money come from for that? Who will run it? This is dangerous. "If that process happens, it's going to be a very poor state. Sooner or later Ukraine will fall apart."